This past summer I spent a lovely afternoon having lunch with my friend and former colleague Bill. As always happens when two kindergarten teachers get together our conversation drifted to the classroom. Bill talked about how current trends in education nationwide have made school more stressful for children and for teachers. Even in Bill’s school, where the administration understands the social and intellectual importance of explorative play, there is often not enough time for children to become involved with interesting projects that they can direct at their own pace. Bill spoke, with a wistful voice, of the last few weeks of school when the children were happily engaged in an investigation of bridges. He devoted long stretches of time each day to this interesting project and noticed that the children were working with more self-directed independence and that many yearlong social tensions seemed to dissipate. Out of this discussion came Bill’s decision to begin the year with, what he hopes will be, an exciting, child-directed study of playgrounds. We both believed that this inquiry topic would ‘speak’ to all of the children in the class. Bill (or Mr. Bill as the children call him) wrote to all of the families on his class list informing them of this project and encouraging the children to think about playgrounds during their summer vacation. So far, the email responses from parents indicate that they are mostly concerned that their children have fun, enjoy school and grow as a person. It certainly seems as though they will be eager to support and become involved with their children’s investigation into playgrounds. I became quite excited about this project and asked Bill if I could ‘follow’ his children and him along this journey of exploration. 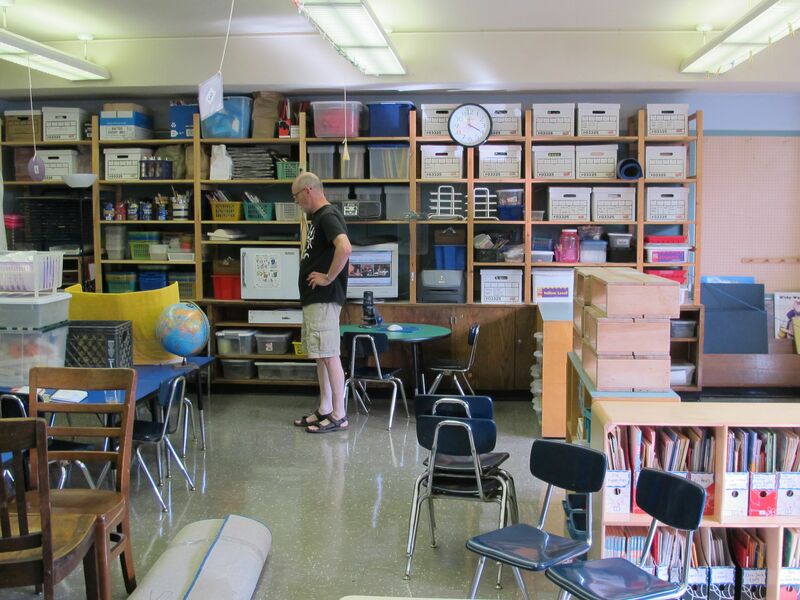 Bill was intrigued with this idea and so, on my blog, we will be visiting Bill’s classroom and meeting with Bill to plan and reflect throughout the year. 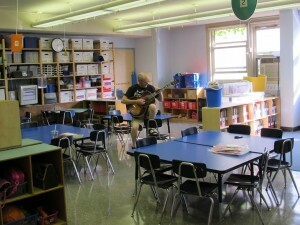 During the week before school was to begin, Bill started getting the classroom set up. To support play and explorations, it was important to leave ample room for extensive block building and also for dramatic play, science and art. This became quite a challenge. 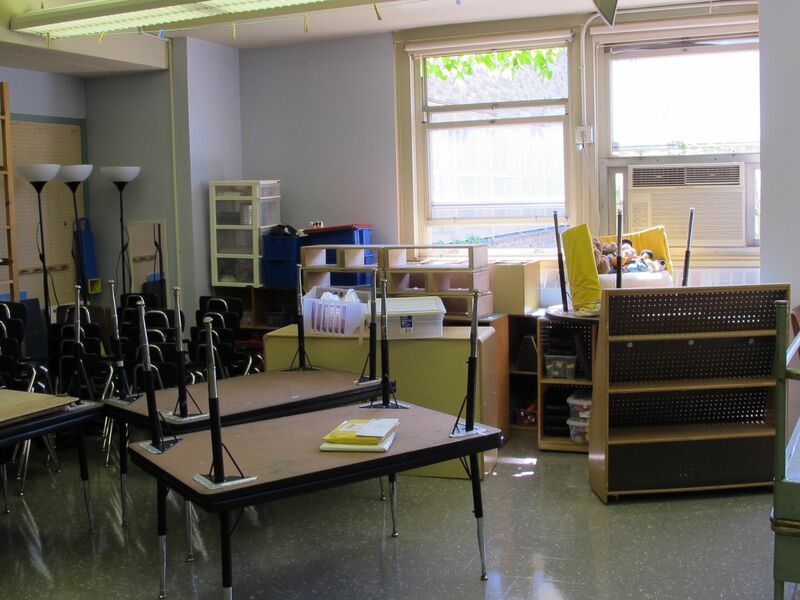 I remembered so well wanting to stretch out the walls of my classroom, giving enough room for all my centers and maintaining a sense of space and openness. Bill decided that, instead of designating a separate classroom area for dramatic play (pretend play), he would use hollow blocks and prop baskets, keeping them stored in a corner of the classroom meeting area/library. That would give the children a lot of space for their play and also the ability to reinvent their ‘script’ each day. Doing this also created more area for a spacious block-building center. When I visited Bill, the day before school was to open, he was in the midst of getting ready for the children…. putting names around the room, setting up a cozy reading corner, hanging curtains, setting up his art center, and completing the myriad of details that will let the children know that this welcoming space is ready for them! hmm...now what should I do next? Time out for a song! This entry was posted in Investigating Choice Time: Inquiry, Exploration, and Play and tagged block building, child-directed, Dramatic Play, exploration, investigation, kindergarten, parents, play, playgrounds, pretend, teaching, trends in education on September 8, 2011 by Renee. Wonderful! Love this post, and this idea. 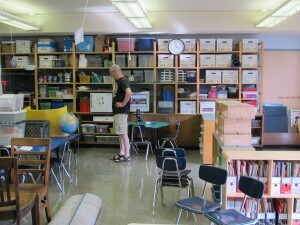 I’m so excited to get glimpses into the world of Mr. Bill’s classroom. What a great collaboration! Thanks. Wonderful! 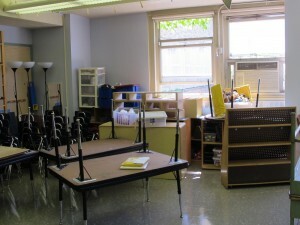 Can’t wait to get glimpses into Mr. Bill’s classroom. What a great collaboration! Wonderful to read the last two blogs, which I just caught up on. 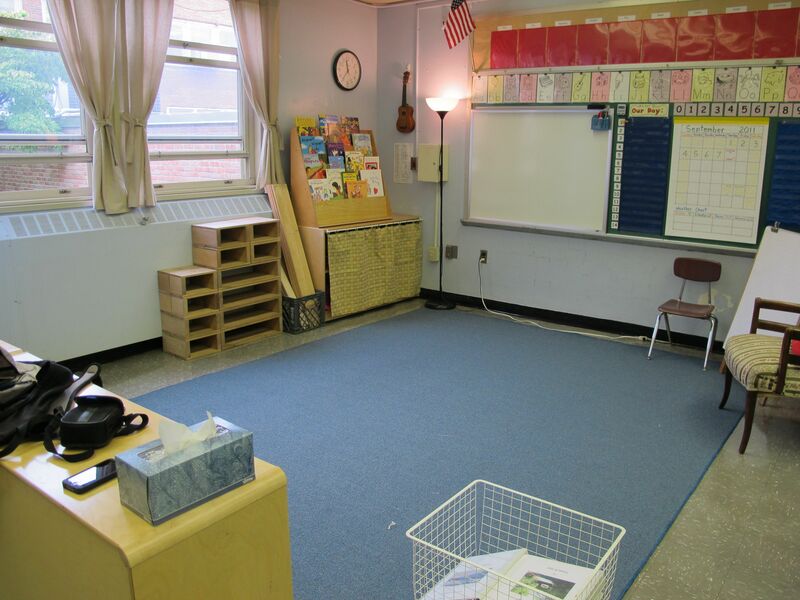 I love the creative use of space – using the rug area for dramatic play, with stored props. I think it will have an impact beyond center time, allowing children to act out stories for others in the class. I love the idea of studying emergency care – it’s all around us in the city, and we know that children are concerned about safety: so it strikes me as an extremely rich topic, with lots of room for exploration, writing, play-acting, etc. I like your earlier note (June) on how children’s shared experiences, as they undertook social studies investigations, led to more/better writing.